Hartnett Physical Therapy is proud to be the sole Mayo distributor of Vibram Fivefingers, a revolutionary new footwear design that promotes a natural walking and running gait. 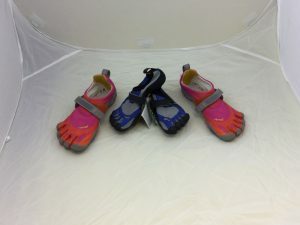 Fivefingers make running safer by encouraging a forefoot strike and a more naturalrunning form, thereby reducing the impact on the knees, hips and lower back. Experts believe the shoes we wear are not only reshaping, but weakening our foot and leg muscles, leaving them lazy, underdeveloped and more prone to injury. Joe Warne, Irish Runner (2011), explored the science of barefoot running stating that ‘virtually all the recent scientific research in this area has concluded that the structures and cushioning in modern running shoes increase the risk of injury.’ When running in conventional shoes, one tends to land heavily on the heel, which sends huge impact up through the body. We also lose the strength in our feet and lower legs because the shoes take on this role, which leads to fallen arches and weak tissues. When we run barefoot, we revert to our natural running cycle. We automatically bring our feet underneath our hips, landing on our forefoot or midfoot, naturally selecting the softest way to land. Barefoot running strengthens our feet, legs and arches. We use our calves to help propel us forward, our achilles tendon as our natural shock absorber and we bend our knees more and use less energy per stride. We also practically halve the amount of impact per foot strike then when wearing a conventional shoe. 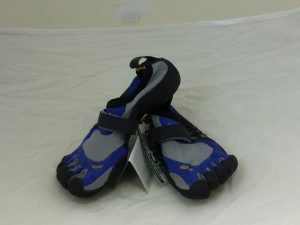 Barefoot Fivefingers, the natural footwear alternative, also improve the range of motion in the ankles, stimulate neural function which is important to balance and agility, improve proprioception and body awareness and eliminate heel lift to align the spine and improve posture.